The parking plan has been announced for the Las Vegas Ballpark in advance of the season and grand opener on Tuesday, April 9! LAS VEGAS, NV (March 25, 2019) - The Howard Hughes Corporation® (NYSE: HHC), developer of Las Vegas Ballpark® and owner of the Las Vegas Aviators®, the city's oldest professional sports team and a member of the Pacific Coast League (PCL) and affiliate of the Oakland Athletics, announces the parking plan for Las Vegas Ballpark in advance of the season and stadium opener on April 9. According to Kevin T. Orrock, President, Summerlin, a combination of personnel from Metro and Parking and Transportation Group-Las Vegas (PATG-LV), a third-party vendor working for Las Vegas Ballpark, will oversee the ingress and egress of traffic from the Ballpark-controlled lots. "We have worked diligently with all teams to develop a comprehensive traffic plan that will include Metro monitoring traffic control points within the area to ensure traffic flow, similar to other major venues in the valley," he said. There are three designated Las Vegas Ballpark lots immediately adjacent to the Ballpark and located to the east, southeast and south of the venue. Combined, these surface lots have an estimated capacity of more than 2,500 vehicles. Main entrances to the Ballpark are located on the east and west sides. Access points for the Ballpark are from the east into the outfield entrance, and from the west at the main entry and suite/VIP entrance. Downtown Summerlin valet is the official Rideshare location for Las Vegas Ballpark. Guests who use Rideshare services will be directed to the Dining Arroyo at Downtown Summerlin to be picked up after an event. Overflow surface lot parking is located on the west side of Downtown Summerlin's retail area. An enhanced walkway has been identified from that area of the parking lot through Downtown Summerlin to Las Vegas Ballpark. 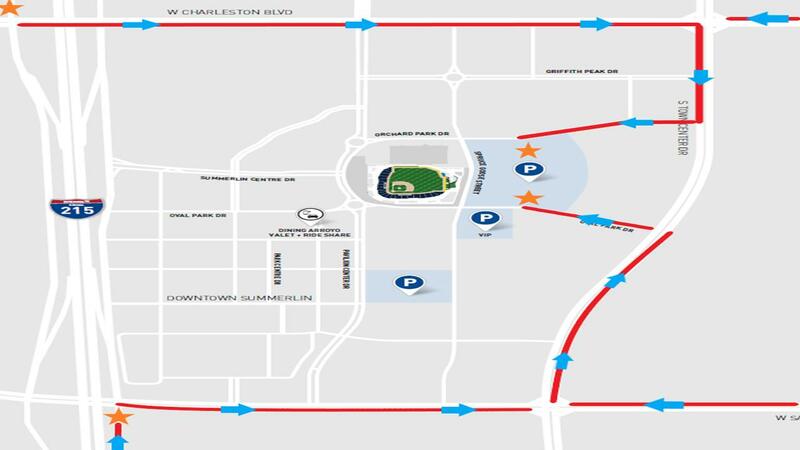 Traffic control personnel will be in place to assist with crossing Pavilion Center Drive before, during and after Las Vegas Ballpark events. An RTC Transit Center is located directly in front of the Ballpark along Pavilion Center Drive, providing mass transit opportunities. The Downtown Summerlin Transit Facility features an open plaza, shaded canopies, benches, bicycle racks and landscaping. Route 206 (Charleston) and the Sahara Express (SX) service the stop and operate 24 hours a day, 7 days a week. For route information, visit rtcsnv.com. like atmosphere in Downtown Summerlin, the site is landscaped to complement the surrounding master planned community. The site is easily accessed from all regions of the valley via the 215 Beltway. The Las Vegas Aviators have the proud distinction of being the longest enduring franchise in the history of professional sports in the state of Nevada. The 2019 campaign will mark the 37th season in the Silver State as a proud member of the Pacific Coast League and the inaugural season in the new Las Vegas Ballpark. The Stars (1983-2000)/51s (2001-18) have reached the 300,000 mark in "home" attendance in all 36 seasons previously at Cashman Field. The Aviators are also in their first season as the Triple-A affiliate of the Oakland Athletics, and the franchise won the PCL championship in 1986 and 1988. The Howard Hughes Corporation owns, manages and develops commercial, residential and mixed-use real estate throughout the U.S. Its award-winning assets include the country's preeminent portfolio of master planned communities, as well as operating properties and development opportunities including: the Seaport District in New York; Columbia, Maryland; The Woodlands®, The Woodlands Hills, and Bridgeland® in the Greater Houston, Texas area; Summerlin®, Las Vegas; and Ward Village® in Honolulu, Hawaiʻi. The Howard Hughes Corporation's portfolio is strategically positioned to meet and accelerate development based on market demand, resulting in one of the strongest real estate platforms in the country. Dedicated to innovative placemaking, the company is recognized for its ongoing commitment to design excellence and to the cultural life of its communities. The Howard Hughes Corporation is traded on the New York Stock Exchange as HHC. For additional information visit www.howardhughes.com.